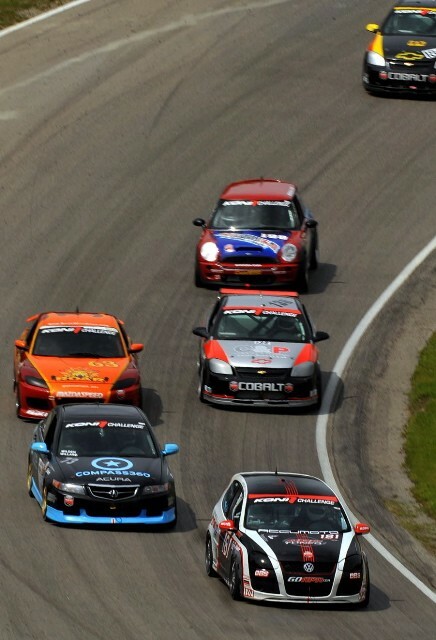 June 15, 2008 - Bowmanville, Ontario: APR Motorsport experienced it's first top ten this weekend during what proved an event filled and fast KONI Challenge ST series race. The Randy Pobst and Mark White driven #181 APR Motorsport/Team Janica Racing VW GTi, which Mark White qualified 7th on the grid, finished 9th in class while achieving the second (Pobst) and third (White) fastest laps out of more than 60 drivers in class. White started the race and ran cleanly and consistently, holding onto the 7th place qualifying spot until he was punted off the track in turn 1 at the 15 minute mark by the #57 Cobalt of Predator Motorsport. White, who was able to just keep the car off the wall, proceeded on, losing only one position. On a positive note, White turned the fastest time of the race to that point (1:34.908), just before the incident. Roughly 30 minutes later, under a double yellow, White pitted and turned the car over to the ever-fast Randy Pobst. Quality pit work and strategy saw the #181 GTi enter the pits in 8th, and leave in 3rd place. During the restart, Pobst, who was now in 3rd place, was bumped on inside right rear corner of the bumper at turn 1, detaching the drivers side and leaving the bumper hanging off the back of the car. KONI Challenge stewards deemed this a safety hazard and Pobst was called to the pits with roughly 50 minutes left in the race in order to have the bumper repaired. Reentering the race in 13th, Pobst saw three successive double yellows, taking up about 30 minutes of race time, quash his chances for making a run into the top five, something he thought was possible before the yellows. When the final double yellow ceased and the race was restarted with three laps to go, Pobst knew he had a top ten finish in the cards. Over the last three laps of the race, Pobst passed three cars to get to 9th place. Pobst had 8th secured for a short moment at the exit of the famed Moss turn, passing Peter Cunningham on the outside of the exit of Moss, but was promptly re-passed down the back straight by his fellow World Challenge veteran in the I-MOTO Racing TSX, leaving Pobst to finish in 9th. White said about the race: "That was one competitive and aggressive race. I think our car was hit on each corner at least once, but the end result was worth it, for sure. I went out there with the attitude to gain as many positions as I can, keep my nose clean and hand the car over to Randy in as great a position as possible. I though our day might have been over when I was hit at turn 1, but I was able to narrowly keep it off the wall and the car seemed pretty much undamaged. My VW GTi really came into balance about mid race, just as we hoped it would. When I gave the car to Randy, I knew the car was good enough to podium." Randy added "We really had the podium in our sites. I was on cruise control in 3rd with less than 45 minutes to go when the crew notified me the officials wanted me to come in and get the rear bumper fixed. It's really too bad, as I think I could have held that 3rd place and maybe even had 2nd, had that bumper not come lose during that incident during the restart. Oh well, those are the breaks. I must say, though, that I am just so happy with the development of the car. It was really neutral and balanced, something you really need on the fast sweepers at Mosport. The crew did a great job in the pits, as well. Any time you can gain positions in the pits, you know you crew did a fantastic job. Mark, also, did a really great job this weekend, both in qualifying and the race, and I really come away from this weekend with a big smile on my face, despite missing what could have been our first podium."